Ludwig van Beethoven (baptized December 17, 1770 – March 26, 1827)(Beethoven was baptized on December 17, 1770. Children of that era were usually baptized the day after their birth, but there is no documentary evidence that this occurred in Beethoven's case. It is known that his family and his teacher Johann Albrechtsberger celebrated his birthday on December 16. While the known facts support the probability that December 16, 1770 was Beethoven's date of birth, this cannot be stated with certainty.) was a German composer and pianist, generally regarded as one of the greatest figures in the history of music. He was the preeminent figure in the transitional period between the Classical and Romantic eras of Western classical music, profoundly influenced by the ideals of the French Revolution, only to be disillusioned with the betrayal of those ideals during the Napoleonic era. His reputation and genius have inspired—and in many cases intimidated—ensuing generations of composers, musicians, and audiences. Beethoven's personal life offers a startling counterpoint to his majestic compositions. Of irritable temperament and physically unimposing, the composer frequently quarreled with family members, colleagues, and patrons. Beethoven was deeply frustrated in his relations with women and never married. He also suffered serious physical infirmities and chronic pain, perhaps most significantly the progressive loss of hearing, leading to total deafness during the period of writing some of his most sublime works. Critics have noted that, in both his greatest orchestral works and choral music, Beethoven explores the inner struggle, and ultimate triumph, over doubt. Beethoven's music has been recognized as a towering profession of faith, composed in an era of growing skepticism over traditional religious teachings. Beethoven was born at Bonngasse 515 (today Bonngasse 20) in Bonn, to Johann van Beethoven (1740—1792) and Magdalena Keverich van Beethoven (1744—1787). Beethoven was baptized on December 17, but his family and later teacher Johann Albrechtsberger celebrated his birthday on December 16. 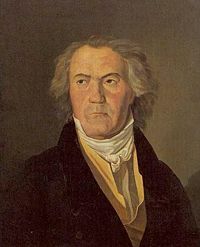 Beethoven's first music teacher was his father, a musician in the Electoral court at Bonn who was apparently a harsh and unpredictable instructor. Johann would often come home from a bar in the middle of the night and pull young Ludwig out of bed to play for him and his friend. Beethoven's talent was recognized at a very early age and his first important teacher was Christian Gottlob Neefe. In 1787, young Beethoven traveled to Vienna for the first time, where he may have met and played for Mozart. He was forced to return home because his mother was dying of tuberculosis. Beethoven's mother died when he was 18, and for several years he was responsible for raising his two younger brothers because of his father's worsening alcoholism. Beethoven moved to Vienna in 1792, where he studied for a time with Joseph Haydn in lieu of Wolfgang Amadeus Mozart, who had died the previous year. He received additional instruction from Johan Georg Albrechtsberger (Vienna's preeminent counterpoint instructor) and Antonio Salieri. Beethoven immediately established a reputation as a piano virtuoso. His first works with opus numbers, the three piano trios, appeared in 1795. He settled into the career pattern he would follow for the remainder of his life: Rather than working for the church or a noble court (as most composers before him had done), he supported himself through a combination of annual stipends or single gifts from members of the aristocracy, income from subscription concerts, concerts, lessons, and sales of his works. Beethoven's personal life was troubled. Around age 28, he started to become deaf, which led him to contemplate suicide (see the 1802 Heiligenstadt Testament). He was attracted to unattainable (married or aristocratic) women; he never married. His only uncontested love affair with an identified woman began in 1805 with Josephine von Brunswick; most scholars think it ended by 1807, because she could not marry a commoner without losing her children. In 1812, he wrote a long love letter to a woman only identified therein as the "Immortal Beloved." Several candidates have been suggested, but none has won universal support. 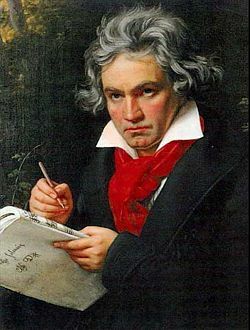 Some scholars believe his period of low productivity from about 1812 to 1816 was caused by depression resulting from Beethoven realizing that he would never marry. 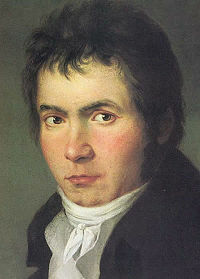 Beethoven quarreled, often bitterly, with his relatives and others (including a painful and public custody battle over his nephew Karl); he frequently treated other people badly. He moved often and had strange personal habits, such as wearing dirty clothing even as he washed compulsively. Nonetheless, he had a close and devoted circle of friends his entire life. Many listeners perceive an echo of Beethoven's life in his music, which often depicts struggle followed by triumph. This description is often applied to Beethoven's creation of masterpieces in the face of his severe personal difficulties. Beethoven was often in poor health. According to one of his letters, his abdominal problems began while he was still in Bonn, and thus can be dated to before 1792. In 1826, his health took a drastic turn for the worse, leading to his eventual death. The autopsy report indicates serious problems with his liver, gall bladder, spleen, and pancreas. There is no general agreement on the exact cause of death. Modern research on a lock of Beethoven's hair cut from his head the day after he died and a piece of his skull taken from his grave in 1863, both now at the Beethoven Center in San Jose, California, show that lead poisoning could well have contributed to his ill-health and ultimately to his death. The source (or sources) of the lead poisoning is unknown, but may have been fish, lead compounds used to sweeten wines, pewter drinking vessels, lead-based medicinals, or long sessions in mineral baths. It is unlikely that lead poisoning was the cause of his deafness, which several researchers think was caused by Paget's disease, cochlear otosclerosis, or an autoimmune disorder such as systemic lupus erythematosus, although recent studies have shown that some lead poison victims have suffered from hearing loss as well. The hair analyses did not detect mercury, which is consistent with the view that Beethoven did not have syphilis (syphilis was treated with mercury compounds at the time). The absence of drug metabolites suggests Beethoven avoided opiate painkillers. Beethoven's grave in the Zentralfriedhof, Vienna. Beethoven died on March 26, 1827, at the age of 56, after a long illness. He was buried in the Währinger cemetery. Twenty months later, the body of Franz Schubert (who had been one of the pallbearers at Beethoven's funeral) was buried next to Beethoven's. In 1888, both Schubert's and Beethoven's graves were moved to the Zentralfriedhof (Central Cemetery), where they can now be found next to those of Johann Strauss I and Johannes Brahms. It could be said that Ludwig van Beethoven was a child of the French Revolution. The French Revolution liberated humankind in ways that allowed for greater freedom of expression, and as such, composers of the Romantic era, from Beethoven through Mahler, would write music that represented the direct outpouring of one’s innermost emotions. He initially dedicated his third symphony, the Eroica (Italian for "heroic"), to Napoleon in the belief that the general would sustain the democratic and republican ideals of the French Revolution, but in 1804 crossed out Napoleon's name on the title page upon which he had written a dedication to him, as Napoleon's imperial ambitions became clear, and renamed the symphony as the "Sinfonia Eroica, composta per festeggiare il sovvenire di un grand Uomo," or in English, "composed to celebrate the memory of a great man." Seek Him in the heavens. Critics have noted that, in both his greatest orchestral works and choral music, Beethoven explores the inner struggle, and ultimate triumph, over doubt. Beethoven's music has been recognized as a towering profession of faith, composed in an era of growing skepticism over traditional religion. Beethoven composed in a great variety of genres, including symphonies, concerti, piano sonatas, string quartets and other chamber music, masses, opera, lieder, and various other genres. He is viewed as one of the most important transitional figures between the Classical and Romantic eras of musical history. As far as musical form is concerned, Beethoven built on the principles of sonata form and motivic development that he had inherited from Haydn and Mozart, but greatly extended them, writing longer and more ambitious movements. But Beethoven also radically redefined the symphony, transforming it from the rigidly structured four-ordered-movements form of Haydn's era to a fairly open ended form that could sustain as many movements as necessary, and of whatever form was necessary to give the work cohesion. In the sonata form, the primary theme is stated in the exposition in the tonic (or home) key and a second theme is then presented in a contrasting key center. These themes then undergo various permutations in the middle development section, often appearing in different key centers. In the recapitulation the original themes are restated in the “home” key before the arrival of the coda. The opening movements of Beethoven’s symphonies, concerti, and sonatas are among the greatest examples of this particular musical architecture. For nearly a century, Beethoven’s nine symphonies stood as the paragon of the symphonic literature. This music, with its sublime organic development, its ingenious invention and manipulation of musical materials and its exemplary formal efficiency, has a transcendent quality that continues to speak to the collective consciousness of humanity. Beethoven's career as a composer is usually divided into Early, Middle, and Late periods. In the Early period, he is seen as emulating his great predecessors, Haydn and Mozart, while concurrently exploring new directions and gradually expanding the scope and ambition of his work. Some important pieces from the Early period are the first and second symphonies, the first six string quartets, the first two piano concertos, and the first twenty piano sonatas, including the famous Pathétique and Moonlight. The Middle period began shortly after Beethoven's personal crisis centering around deafness. The period is noted for large-scale works expressing heroism and struggle; these include many of the most famous works of classical music. Middle period works include six symphonies (Nos. 3–8), the last three piano concertos, triple concerto and his only violin concerto, five string quartets (Nos. 7–11), the next seven piano sonatas including the Waldstein and Appassionata, and his only opera, Fidelio. Beethoven's Late period began around 1816, and lasted until Beethoven's death in 1827. The Late works are greatly admired for and characterized by their intellectual depth, intense and highly personal expression, and experimentation with forms (for example, the Quartet in C Sharp Minor has seven movements, while most famously his Ninth Symphony adds choral forces to the orchestra in the last movement). This period includes the Missa Solemnis, the last five string quartets, and the last five piano sonatas. His Ninth Symphony, in the estimation of musicologist Harold C. Schonberg, “is music turned inward, music of the spirit, music of extreme subjectivity and extraordinary grandeur.” It is a work that embodies the "spirit" of Romanticism, though it would be Franz Schubert and Robert Schumann who would forge the new compositional style, especially with regard to form and harmonic invention, reflective of what would come to be known as Romantic style. Considering the depth and extent of Beethoven's artistic explorations, as well as the composer's success in making himself comprehensible to the widest possible audience, the Austrian-born British musician and writer, Hans Keller, pronounced Beethoven "humanity's greatest mind altogether." ↑ Joseph Otten, "Ludwig von Beethoven," The Catholic Encyclopedia, Volume XV. (New York: Robert Appleton Company, 1912). ↑ William Meredith, The History of Beethoven's Skull Fragments. Retrieved October 15, 2007. Albrecht, Theodor, and Elaine Schwensen. "More Than Just Peanuts: Evidence for December 16 as Beethoven's birthday." The Beethoven Newsletter 3 (1988): 49, 60-63. Meredith, William. "The History of Beethoven's Skull Fragments." The Beethoven Journal 20 (2005): 3-46. Beethoven-Haus Bonn. Official website of Beethoven-Haus in Bonn, Germany. Links to extensive studio and digital archive, library holdings, the Beethoven-Haus Museum (including "internet exhibitions" and "virtual visits"), the Beethoven-Archiv research center, and information on Beethoven publications of interest to the specialist and general reader. Extensive collection of Beethoven's compositions and written documents, with sound samples and a digital reconstruction of his last house in Vienna. Raptus Association for Music Appreciation site on Beethoven. Contemporary reviews of Beethoven's works. Für Elise—and other Beethoven resources. Ludwig van Beethoven, NPR Music. The Unheard Beethoven—MIDI files of hundreds of Beethoven compositions never recorded and many that have never been published. History of "Ludwig van Beethoven"
This page was last modified on 3 August 2018, at 16:52.